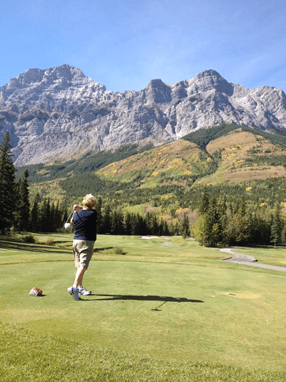 “One time, my guest Richard and I were playing Mt Lorette on an early-season spring day. We were on Hole 5, and the morning sunrise was lighting up the course. Richard looked up and said, “Wow, Mess – check it out! Avalanche starting at the top of Mt Kidd!” First, we watched the powerful glory of the snow building momentum down the warming stone face. Then we heard and felt the magical rumble that followed. For a moment or two, we forgot that we were even playing golf. It was absolutely spectacular. The beauty of the moment hypnotised us! That memory is etched into our minds forever. 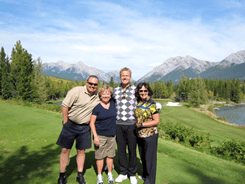 After the devastation of the floods, I am proud that the Kananaskis team was steadfast in pursuing the only right choice: to rebuild the course. They wanted to ensure future generations could share the magic we experienced on that spring morning on Lorette. 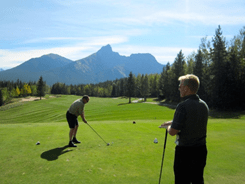 The course will serve as a living treasure throughout Albertan history. It is my hope that the beauty and friendliness of Kananaskis will receive continued recognition and support from future generations of Albertans. Seeing the excitement in people’s eyes when playing the course is a great reminder of how lucky we are to have this facility for public use.